We were recently in Atlanta as a sponsor of the USPTA Southern Conference Welcome Party. We met with Tim Noonan, one of the Managing Partners at UTA, to discuss the impact their two (2) Green Tennis Machines have had on all their academy locations. I’m Tim Noonan and recommend the Green Tennis Machine to anyone who is looking to save money on tennis balls or re-pressurize tennis balls in bulk. It has been a great thing for Universal Tennis Academy and Universal Tennis Management. Here at Universal Tennis Management in Atlanta, GA. We manage nine (9) tennis facilities both public and private in the city of Atlanta. We have two Green Machines! 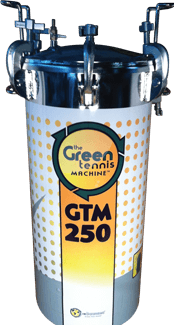 We have been using the Green Machines for several years and has saved us thousands of dollars from buying new tennis balls and made it very easy for us to keep good balls in our baskets. We do use the Green Machine with QuickStart, Green Dot Balls especially which need a little more compression than the Orange and Red. We have been using with QuickStart balls for over two years now. You have to be organized. You have to go through and figure out which balls need to be recycled. It is not a difficult process. When you look at the time it takes to do it versus the savings and money saved it really is a no brainer!